Matrix: A matrix is an ordered array of numbers (or functions). The numbers (or functions) are called the elements or the entries of the matrix. The horizontal lines of elements are said to form rows of the matrix and the vertical lines of elements are said to form columns of the matrix. In this example, we have two rows and three columns. 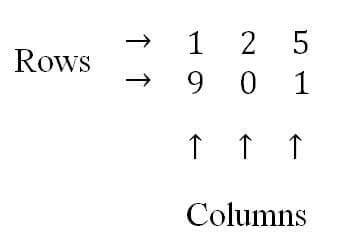 Order of a Matrix: A matrix having m rows and n columns are called a matrix of order m × n.
In above example, the order of matrix is 2×3 since there are two rows and three columns. The order of this matrix is 3×3. In general, we use the notation [aij]m×n to indicate a matrix of order m × n.
Here i= 1,2,….,m and j= 1,2,…,n. Here a11 indicates the element corresponding to the 1st row and 1st column. Similarly, a32 means element corresponding to the 3rd row and 2nd column. Write order, the number of elements and the elements of a12,a13,a23,a32. Solution: The order of the matrix is 3×3. No of elements are 3×3=9. Similarly a23= 0 and a32 =5. aij = e2ix sin jx . In this article, ‘Matrix’ from CBSE Class 12th Maths is being discussed.